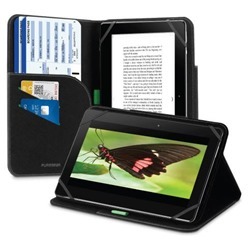 The Universal Tablet Folio’s innovative design features flexible bands that can hold virtually any tablet in place. The convenient case utilizes built-in props for hands-free viewing and typing, perfect for catching up on emails and reading on the go. Multiple slots on the inside of the Folio hold documents, credit cards and IDs; so that you can always keep your most important items close at hand.